Jimmy Olsen finds himself tricked into attending a meeting for the Kobra cult. He takes pictures of the assembly, but barely escapes the members' wrath before a large blue energy ball appears and leaves destruction in its wake. The next morning, Jimmy finds himself at the Daily Planet, unsure if he can trust Perry with the Kobra photos. At the Exelon Observatory, Lois and Sam Lane meet up in private. 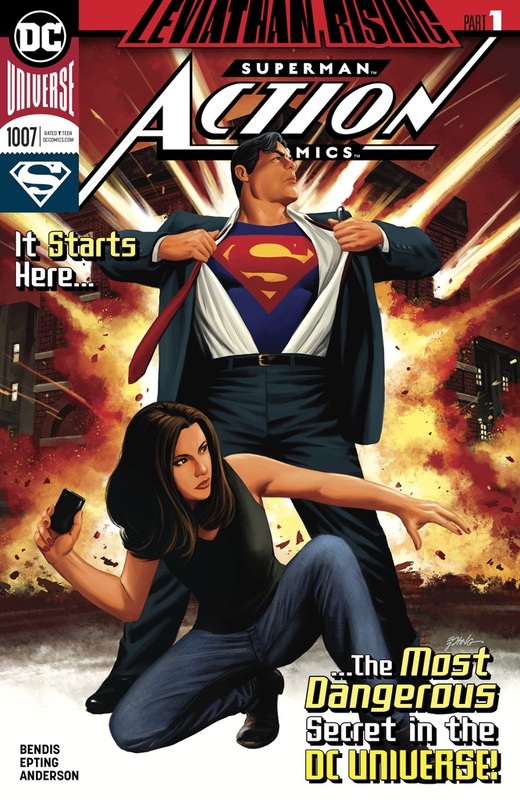 Attempting to continue the progress made in Action Comics #999, Lois reveals to Sam that she married Superman. Sam walks away silently. In Metropolis, Superman flies through the city when he hears someone call his name. Flying as fast as he can, the Man of Steel finds Amanda Waller falling from a building. Whoever attacked her had good intel, but as Superman goes to investigate, another blue energy ball appears. After rescuing citizens in the blast area, Superman returns to the ground to find Waller missing. Story - 3: I'm so glad we're done with the Red Cloud story. I know it'll come back around, but it's nice to see a new adventure. Bendis does a great job getting me interested in this new chapter. We get progress on the relationship between Sam and Lois, a Jimmy Olsen subplot, and a mysterious new threat. I do, however, have some problems with the issue. For starters, the dialogue was a bit clunky in some places. There's a sequence of panels in the Sam/Lois scene that were either a bit too wordy or would have worked much better if dialogue were omitted. There's also a bit of forced exposition after Superman saves Amanda Waller. She mentions she's the leader of Task Force X, but Superman knows this. Long-time readers know this. My guess is that Bendis wanted to give new readers a quick summary of who she was so they knew her relevance to the story. Waller continues to mention that her location is top secret, but she's in the middle of Metropolis announcing her identity and bringing up a top secret shady government team. It was nice to see some continuation of the rebuilding of the Sam/Lois relationship. Rebuilding that relationship would open up a lot of new storytelling doors and lend itself to character development. The concept of Sam learning Clark's secret is a great idea, too. Regardless of how he feels about the whole thing, story material basically writes itself. But is it really Lois' place to reveal that secret? I mean, Sam despises her husband and would do anything to have him eradicated. Is it really her right to let her father know she married one of his enemies? It's more Clark's decision than anything unless he gave her the go-ahead. Looking at it from a storytelling standpoint, you could probably get a bit more out of the scene emotionally if Clark had been the one to tell him. As it stands, the scene is fine. I look forward to seeing what happens next, but I also hope we find out why she was the one to tell Sam. Art - 2: The art in this issue is serviceable. There are some great panels and then there are panels that could have used a second pass. If it weren't stated in dialogue, I probably wouldn't have guessed that I was looking at Lois Lane. I can't put my finger on it, but there just seems to be an off-putting bulbousness to everything. Maybe it's the inking, maybe it's Epting. Cover Art - 4: What a cover! It's eye-grabbing, bombastic, and what I think of when I think Superman comic books. Clark's face could have used another pass or two, but other than that, I really like this cover. 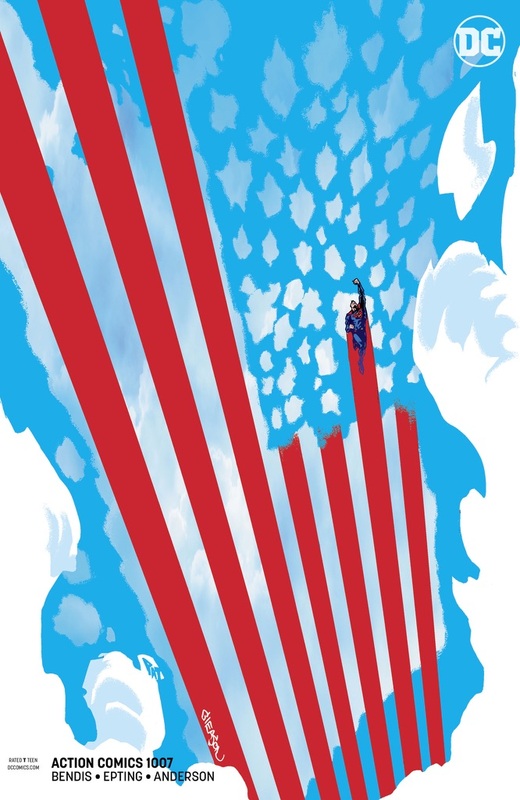 Variant Cover Art - 3: I appreciate what Gleason was trying to do. It's a nice patriotic image, but I'm not sure of the logic. How did Superman make those streaks? I know it's motion blur from his cape as he zips through the skies, but how did he achieve the striped pattern? I understand the longer streaks, but what about the shorter, more abrupt streaks? How did he achieve those? Perhaps I'm thinking a little too hard about it. In the end, it's a good cover. Though Superman could probably be a little larger.